There was a woman in a small village in Aitoloakarnania and had three children. Kyra Vasiliki managed to raise up her family with incredible deprivations and difficulties, but with a unique dignity! She died on Dormition eve in 1998. The next day, on August 15, the cheap coffin with her corpse, which was on the chassis of the priest’s small van, was headed toward the cemetery. If thousands of flowers were there, no such aroma would be possible !!! Elder Ambrosius, at first, remained silent. Then, he walked into his room, stayed for a while there, and then returned. I discovered Saint Savas and his monastery during my recent pilgrimage to Kalymnos. It is an awe-inspiring place , a place one step below heaven. Iconography beyond aesthetic, historical and religious value and the Saint is so alive! The patron saint of the island, Agios Savvas, has performed miracles and has blessed homes all over the world. During my recent pilgrimage to Patmos, on my way back through Kalymnos, I venerated the incorrupt relics of an amazing ascetic and Saint of the “latter days”, our Holy Father Savvas the New of Kalymnos. I even spoke to people whose parents confessed to him and remember with tears his love, compassion and angelic purity. In Athens he met the acolyte of Saint Nektarios, who informed him that Saint Nektarios was looking for him. Based on this fact, it is assumed that the two saints had met before; in fact, most biographers agree that St Savvas was St. Nektarios’ spiritual child. Therefore, he went from Athens to Aegina in 1919, where he was with Saint Nektarios until he reposed. There he served as a priest in the Convent of the Holy Trinity. He taught the nuns iconography and ecclesiastical music. Upon the repose of Saint Nektarios in 1920, Savas witnessed the first miracle of the Saint when, after his repose, St. Nektarios leaned over so that St. Savas could attire him with his epitrahelion [ie. stole], and then the Saint returned back to his previous rigour mortis (ie. postmortem rigidity). 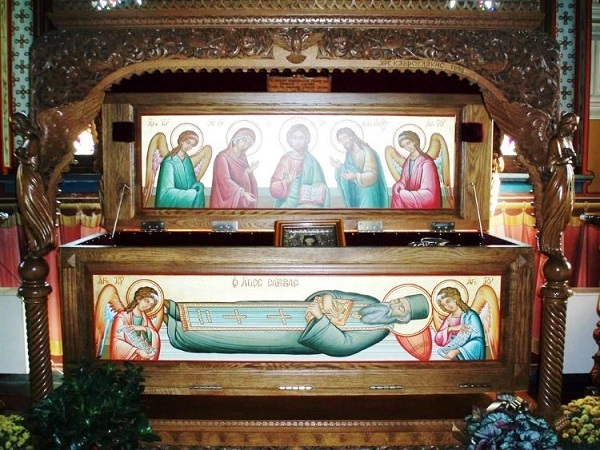 St. Savas performed the funeral and for the first three nights he continued his communication with St. Nektarios over his grave, asking him a number of questions and listening to his answers! St. Savvas’ biographers have recorded those facts from first-hand witnesses and the stunned nuns’ testimonies. Then, St. Savas enclosed himself in a cell for forty days where he lived in strict prayer and fasting, and emerged holding an icon of Saint Nektarios he had painted, which was the first icon of the Saint to exist. He gave the icon to the abbess ordering her to offer to the faithful for veneration. The abbess told him that this was not possible, as St Nektarios had not been yet officially canonised despite his numerous miracles from the very first moment of his repose and that such an action was not prudent and might get them in trouble with the ecclesiastical authorities and even cause the shutting down of the monastery. But St. Savas insisted that “You must obey. Take this icon and offer it for veneration and do not scrutinise God’s Ways”. Let us faithful praise Holy Savvas, the glory and protector of Kalymnos, and peer of the Holy Ascetics of old; for he has been glorified resplendently as a servant of Christ, with the gift of working miracles, and he bestows upon all God’s grace and mercy. Today the island of the Kalymnians celebrates your holy memory with a rejoicing heart; for it possesses as truly God-given wealth, your sacred body that has been glorified by God, O Father Savvas, approaching which they receive health of both soul and body. Rejoice, thou new star of the Church, the offspring of Thrace and the beauty of Kalymnos, O God-inspired Savvas, fellow citizen of angels and equal of all the saints. And are glorified with them by your numerous miracles. This angel on earth and a human in heaven was born in 1862 Herakleitsa, Eastern Thrace, Ottoman Empire and reposed in our Lord on 7 April 1947 (aged 85). He lived as a monastic and practiced the arts of Iconography and Ecclesiastical Music in the Saint Anna’s Skete (Mount Athos), the historic Monastery of Saint George Chozeba, the Convent of the Holy Trinity (Aegina), the monastery of St John the theologian and Evangelist (Patmos) and the Convent of All Saints (Kalymnos) and a number of caves and hermitages all over the world. His feast day is 7 April (25 March), The Fifth Sunday in Lent and was canonised in 1992. For those who have never heard of him, a synopsis of his life can be found at the Mystagogy Resource Page. It was the moment when the fire of 23rd July had completed its life-damaging work in Neo Vujza and Mati (about 7pm in the evening), and started spreading northeast to Agios Andreas where the children’s camps of the Municipality of Athens is located and southwest to Rafina. Those present at the port of Rafina (where they had moved to escape the flames, including my brother) heard the bell in the chapel of Agios Nikolaos, located on a hill just above the harbour. The flames were already threatening the chapel. Some went to the chapel courtyard to see if there was a need for help. Among them was a lady, and on the bench of the courtyard, she saw what looked like the form of a rallying priest who sat on the bench in the fumes and turned his body toward the flames. Impressed, she took a picture on her cell phone from a distance. Approaching, she took another one. But once she reached the bench, the figure disappeared unexpectedly and mysteriously into the smoke. At that moment, the wailing stormy wind suddenly stopped blowing completely, so that the flames were not extended to the settlement of Rafina. A corresponding phenomenon, a sudden interruption of the wind that pushed the northeast flames, happened at the same time on the opposite side, at the boundary between Matio and St. Andrew. The result was to save the main settlement of Rafina and most importantly, save the area of ​​Agios Andreas where the camps were located. It should be noted that 600 young children temporarily resorted to the beach of Agios Andreas whilst waiting for the buses to take them to Athens. The area of ​​Agios Andreas is overgrown with pine trees and with lush vegetation, just like Mattia. If the flames had reached this area, an incredible tragedy would unfold, much worse than what happened in Mati. Note that the fire was expanding at an inconvenient speed, causing people to be trapped in the pass, unable to escape, not even by car. So, the dozens of unfortunate victims of the fire found in the beach at Mati were locked. The lady, a few days later, visited Father Dorotheos, the Parish Priest of the Temple of the Assumption, the parish Church at Mati. She told him the incident with the priest who sat on the bench next to the chapel of St. Nicholas and showed him the pictures. The above story of this lady was narrated by Father Dorotheos to my brother, who lives next to the Church of the Assumption of the Virgin Mary. If you carefully look at the two photographs the lady took, it will distinguish a priest-monk who only wears a robe, holds a prayer rope in his hand and has his body turned towards the flames. The resemblance to Saint Paisios is astonishing. 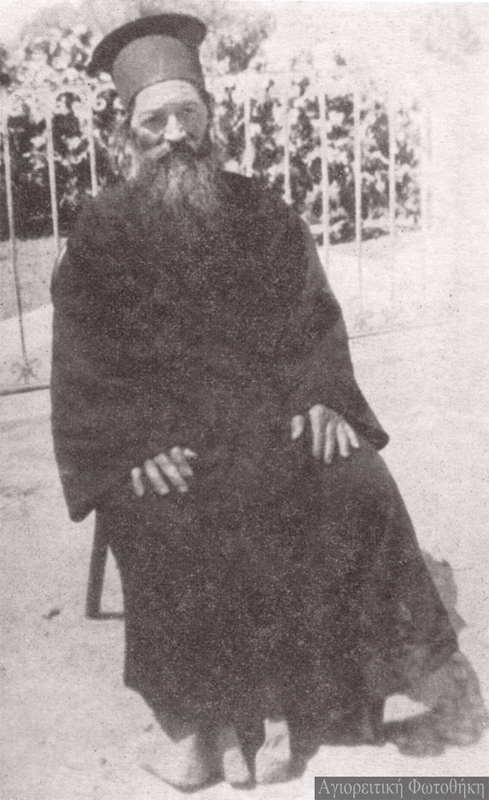 In the closest picture, the cap of Saint Paisios is distinguished in the head of the figure, while on the feet of this figure can be seen flip-flops with socks. Another characteristic of the Saint.